INVESTOR sentiment in the property market has remained weak over the past year and a half. However, a few companies in the sector are outperforming their peers in terms of share price performance because they are in the right segment of the industry — affordable housing. During the property boom, many investors had picked developers with high-end property offerings for their wider margins but that is changing now. Now, companies involved in affordable housing are at an advantage because of the firm demand for competitively priced homes. The outperformers include Mitrajaya Holdings Bhd, Sunsuria Bhd, KSL Holdings Bhd, Matrix Concepts Holdings Bhd and MKH Bhd (see chart). 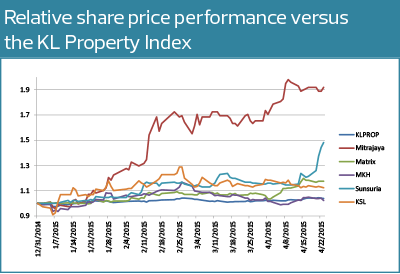 In terms of year-to-date share price gains, four of these companies have delivered returns that are better than the 3.84% recorded by the benchmark KL Property Index. In fact, the affordable housing segment is the major revenue contributor for the five in the immediate term. It is noteworthy that the index lagged behind because of the under-performance of the blue chip property giants that have the biggest weightage among its component stocks. In a recent note, AllianceDBS Research highlights the affordable housing companies as those to watch this year. “Demand for affordably priced properties by genuine homebuyers remains strong, largely supported by favourable demographics. Township developments, in particular, continue to be well received as evidenced by the high take-up rates in some of the recent launches,” says its analyst Quah He Wei, citing MKH Bhd’s 1,600 sq ft Cherry III units in [email protected] Alam, which have seen a take-up of 85% since their launch in March. This new phase comprises 236 two-storey link houses priced at RM540,000. Similarly, Glomac Bhd’s 284 Saujana KLIA homes with a built-up of 1,400 sq ft are fully sold. They were launched in January at RM429,000 onwards. Given the high demand for affordable housing, several niche property developers are already in the segment in a big way. In spite of admittedly lower margins, this mass-market segment offers the best chance for them to ensure minimal unsold units. Some enjoy the added advantage of low land cost, allowing them to enjoy good margins while offering competitive prices. These property players either own parcels in prime areas in the city centre or tracts just outside the Klang Valley. For example, MKH, KSL Holdings and Matrix Concepts are prominently involved in integrated township developments and are launching these steadily in phases. Developers focusing on high-rises, such as Mitrajaya Holdings and Sunsuria, have the added advantage of having launched projects in prime areas in the Klang Valley. Given the rapid appreciation in high-rise values in recent years, sales of sub-RM500,000 units offered by both developers should be brisk. Additionally, these companies are poised to capitalise on pent-up demand for houses in the RM200,000 to RM500,000 range, particularly if the Perbadanan Perumahan Rakyat 1Malaysia (PR1MA) scheme continues to face uncertainty in the future. The lines are starting to blur when it comes to the affordable housing segment, where houses under PR1MA may fetch similar prices as normal units. With the delivery of PR1MA units expected to be delayed as well as other hiccups, property developers can benefit by launching projects in the meantime to meet the rising demand. Medium-cost homes, which are typically defined as those priced between RM200,000 and RM500,000, continue to see encouraging take-up despite the weak overall sentiment in the property market. By comparison, PR1MA houses are set to be priced between RM100,000 and a maximum of RM400,000. Given that PR1MA received 500,000 applications for 80,000 houses as at the end of last month, those who were not successful in their bids are facing a tough choice — whether to wait for new PR1MA launches to accelerate or go for slightly pricier options in the affordable housing segment. “Land prices are not coming down and construction costs will only keep going up. Demand for affordable housing far exceeds incoming supply from PR1MA. 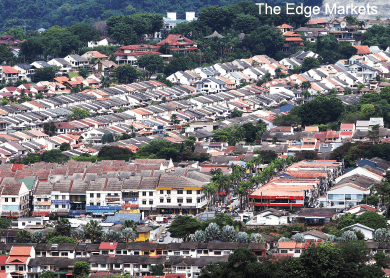 Should the market recover, the prospective homebuyer will only be looking at higher property prices a few years down the road,” says Malaysia Institute of Estate Agents president Siva Shanker. But he also agrees that given the lack of caveats, a typical affordable housing unit would appreciate at a faster rate than a similarly priced PR1MA house. He is sceptical that the units can be priced near the minimum range of RM100,000 as this could result in property developers incurring significant losses. The latest figures in the 2014 property market report by the Valuation and Property Services Department show a significant contraction in transaction volume for houses priced below RM200,000. About 106,575 units in this segment were transacted last year, down 13.5% from 123,245 units in 2013. On the other hand, transactions of units priced between RM200,000 and RM500,000 grew 12% to 102,081 last year from 91,123 in 2013 despite new lending curbs imposed by Bank Negara Malaysia. This implies the demand overhang coming from the sub-RM200,000 units is spilling over into the higher bracket, given the inability of developers to launch new projects cheaply due to cost considerations. He says the prevailing fear is that developers could be incentivised to cut costs in a wholesale manner to keep prices low, thus affecting the quality of finished PR1MA townships or apartments. Apart from the uncertain timeline as to the construction and delivery of the PR1MA units, a 10-year moratorium is also imposed on homeowners, which prohibits them from selling the houses. “In the meantime, there is a niche to be filled by property developers, since housing demand is concentrated on the sub-RM500,000 price range. So developers who focus on affordable housing should do much better than those in high-end luxury developments,” the executive director says.